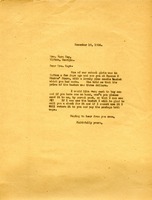 Letter to Miss Ruhnka from Martha Berry, with written note reply. Martha writes to Miss Ruhnka about a pine needle flower basket, that the school is unable to complete, asking if they should hold the order until next fall or return the money. Miss Ruhnka wrote back with a note to hold until the fall. Miss Berry explains that one of the school girls visited Tifton and saw Mrs. Key with a pine needle basket at Duncan and Stubbs' Store. 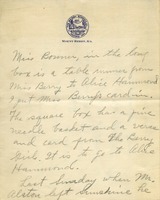 Miss Berry wishes from Mrs. Key to send one of the baskets by parcel post in order to see if it would be of use. If not, Miss Berry would return it and pay for the postage both ways.